Summer is undeniably one of the best times to spend your days outside. Unfortunately, many people with limited mobility find themselves cooped up in their homes as their friends and family unwind in the warm, sunny weather, uninhibited by a wheelchair or other medical support devices. Luckily for you, the Invacare Top End Excelerator XLT Hand Cycle gives you the ability to enjoy the great outdoors like never before! Expertly designed with a 6061 T-6 oval tube aluminum frame, adjustable height, seat position and footrest crank system and top-grade safety straps, the Top End Excelerator XLT Hand Cycle is unlike any other model on the market. Weighing only 35 pounds, this specially engineered wheelchair is perfect for those who like to explore. Whether you’re speeding down a lengthy trail or taking a relaxing stroll through a forest path, this wheelchair will allow you to experience all the wonders the natural world has in store without having to be encumbered by a rickety, troublesome wheelchair. Featuring thick 26” x 1” high-pressure clincher tires, the Top End Excelerator XLT cycle is extremely durable and is capable of withstanding a variety of outdoor terrains. From pebbly beaches to rocky roads, you are able to travel safely with ease wherever your travels may take you! The XLT wheelchair also includes a reverse activated drum and locking parking brake, which is mounted on the right side of the seat frame. This brake allows users to stop anywhere and enjoy the scenic views around them! This model also reaches speeds up to 20 mph and has an impressive turning radius, making maneuvering the cycle a much simpler task. 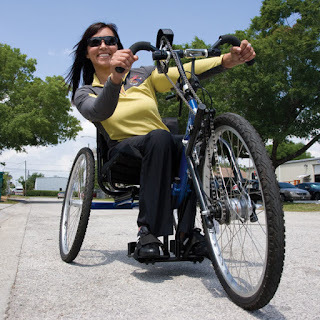 The XLT hand cycle allows for 18’ for 360-degree turns and 12’ for 3-point turns. With such a wide range of mobility, going on thrilling adventures in a hand cycle has never been easier. Gone are the days of worrying whether or not your wheelchair will get in the way of your summertime adventures. Boasting innovative, top-of-the-line technologies, the Top End Excelerator hand cycle is perfect for those who enjoy the thrill of adventurous travel but still want to remain safe and secure while doing so. 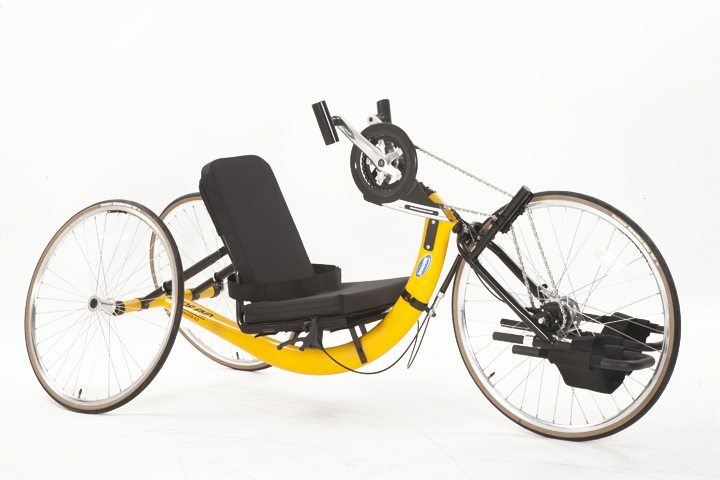 Sit in a comfortable recumbent position as you ride alongside your friends and family, and experience the summer as it should be: by having fun in the sun! If you are looking for a great way to exercise, cross-train or simply have fun, the Top End Excelerator XLT is the hand cycle for you!